Developer Quote: "Futulele is simply the best-sounding Uke synthesizer in the world. The CrystalClear 4.0 sound engine works with 72 highest-quality Ukulele string samples, combining and tweaking them on the fly to deliver fantastic Ukulele experience." Love the relaxed ambiance of Hawaii, Polynesia and other exotic countries featuring a ukelele as a native instrument? Did you know that the ukelele originated in Hawaii and that its name means "jumping flea" because of the deft, quick movements of fingers on the instrument? - Very easy to play! No music background needed! - Strings respond to the speed of strumming! 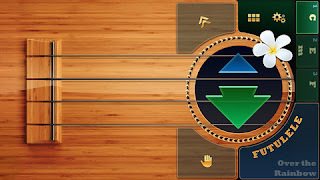 - Can be extended via separate Futulele Remote app for iPhone/iPod Touch. Make your own cyber-ukulele! With 132 chords you are bound to make some pretty cool music! Or you can play your "instrument" using the automatic button - no stressing over chords necessary. Moreover, 15 ways of strumming your ukelele makes music more full and interesting. If you simply enjoy the sound of the ukelele, you are lucky because there are 10 songs ready to go! 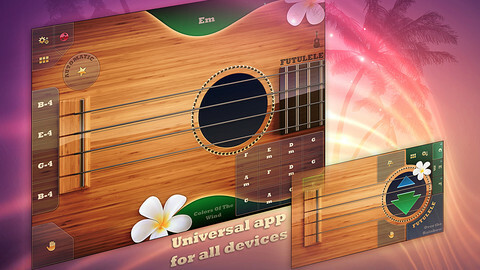 Get your musical groove on this weekend with Futulele - Digital Ukelele. COOL CONCLUSION: Strumming, listening to and enjoying Hawaiian music with the sound of the beautiful ukelele is easy with the slick, intuitive Futulele - Digital Ukelele.